Alyaf’s products ... designed with the GCC market in mind. Alyaf has good reason to celebrate, having commissioned its fourth production line and becoming the first geosynthetic manufacturer in the region to achieve integrated management system (IMS) certification. Alyaf Industrial Company of Saudi Arabia, considered to be the largest manufacturer of geosynthetic products in the Middle East, has achieved two key milestones this year. It has inaugurated its fourth production line, which will exclusively manufacture the company’s latest range of geocomposite products and is expected to increase its geotextile production to an unprecedented capacity of more than 20,000 tonnes per year (tpy). Alyaf’s second milestone this year is achieving Integrated Management System (IMS) certification, becoming the first geosynthetic manufacturer in the region to successfully implement IMS for its compliance to global standards in quality assurance, environment protection and occupational health and safety. The company, which has conformed to stringent quality management systems under ISO 9001 since 2001, has now been awarded the ISO 14001:2004 and OHSAS 18001:2007 certifications under an approved IMS, for the manufacture of geosynthetic products at its Dammam manufacturing facility. “Since its inception in 1992, Alyaf’s commitment has been to protect the environment, reduce its carbon footprint and to ensure a secure working environment for its employees. The IMS certification is a matter of great pride and stands testament to our vision of a forward-looking, safer and a more environment-friendly organisation,” says Nader Nafady, president and CEO. He says Alyaf’s quality control and assurance department, along with a team of dedicated internal auditors, has worked diligently with TUV Nord, one of the industry leaders in management systems certification, to ensure compliance to standards of quality, environmental and occupational safety across organisational functions. “The ISO 14001 environmental management system (EMS) certification means Alyaf’s operations are designed to minimise the negative effect on the environment whereas OHSAS 18001 certification means Alyaf’s operations are designed to control and improve health and safety performance and reduce the potential for accidents,” he highlights. “The year has been phenomenal so far and we expect to see more exciting developments in terms of business and organisational growth. Alyaf, as a market leader for more than two decades, is committed to invest in technologies and practices which are primarily aimed at offering products and service second to none to satisfy the challenging needs of the construction industry,” he comments. Alyaf’s recent partnership with GEOfabrics of the UK to develop drainage geocomposites has reinforced Alyaf’s forefront position to satiate the growing demand for quality products through providing cost effective engineered solutions based on site specific conditions. The Alyafgeo drainage composite product range has been specially developed for civil and environmental engineering applications such as landfills, vertical and horizontal drainage, gas venting systems, membrane protection, salt barriers, green roofs and capillary break layers. “Alyaf’s drainage geocomposite product range has been designed with the GCC market in mind and our techno-commercially valuable solutions have been used in projects across the region,” says Nafady. The company offers technical and professional design support with teams in Dammam, Riyadh and Jeddah, in Saudi Arabia, working and engaging extensively with consultants, contractors and clients to address site-specific solutions. Alyaf recently worked with Aecom, the design consultant, to provide drainage and sewerage solutions for Jeddah’s storm drainage project Phase Two being carried out by China Communications Construction Company (CCCC). 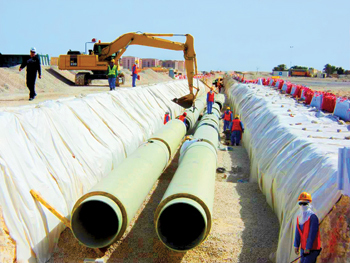 Other projects include a flood control scheme in Yanbu with Saudi Aramco; and the Lusail primary infrastructure development projects with Dorsch and the Doha and Rayyan sewerage project with Khatib and Alami, in Qatar. “Our aim is to continually develop high-performance products with dedicated technical assistance, which will propel us to become the top choice for drainage geocomposites in the Middle East and African markets,” Nafady asserts. With a host of industrial, construction and infrastructure megaprojects lined up ahead, Alyaf is ideally positioned to offer market leading products for an evolving geosynthetics market, he concludes.